Bastiaan Janmaat is a second year MBA candidate at Stanford Graduate School of Business (GSB), where he is co-President of the Entrepreneur Club, and a Director at FounderSoup. Bastiaan is originally from the Netherlands but he was born in Japan and grew up in Singapore. 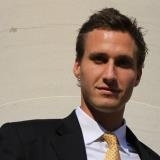 Bastiaan worked as an analyst for three years in Goldman Sachs’ European Special Situations Group (ESSG) in London. In this role, Bastiaan was also a Board Director of Nordic Windpower, an early-stage ESSG portfolio company building two-bladed wind turbines. Bastiaan enjoys playing many sports, including soccer, rugby, and tennis. Katie Fifer is a second year MBA candidate at Stanford Graduate School of Business (GSB) where she is co-President of the Entrepreneur Club and a member of the Venture Studio advisory committee. Katie is a co-founder of DropBy, a platform for coordinating last-minute meals with friends. Prior to the GSB, Katie spent three years as an analyst at Audax Group Private Equity in Boston where she focused on medical technology and industrials. Katie graduated from Harvard in 2008 with a degree in computer science, and has always been passionate about introducing others to the field, largely in her role as undergraduate teaching assistant. Katie enjoys playing a number of sports including basketball, skiing, and swimming. Alex Gelman is passionate about start-ups, venture capital, and search funds. Alex is a co-founder of Super Fantastic Foods, a start-ups focused on developing healthy snack foods. Additionally, Alex is an officer of BASES, the Business Association of Stanford Entrepreneurial Students. Prior to the GSB, Alex worked at KKR Capstone, the operating arm of the private equity firm KKR. At KKR Capstone, Alex worked with portfolio companies on making operational improvements to their business. Prior to KKR Capstone, Alex worked at McKinsey & Co. in their NY and Sydney offices. Alex has sat on Young Professional's Council of the Hetrick-Martin Institute, a non-profit focused on helping LGBT youth in the New York City area.